1) She still seems so little so I thought the several feedings a night were because she needed the nourishment. The pediatrician confirmed that this is not the case, she's a healthy weight, and at this age babies can go for 10-12 hours stretches of sleep with no feedings. They'll eat if you give it to them, but that's for comfort and not necessarily because they are hungry. 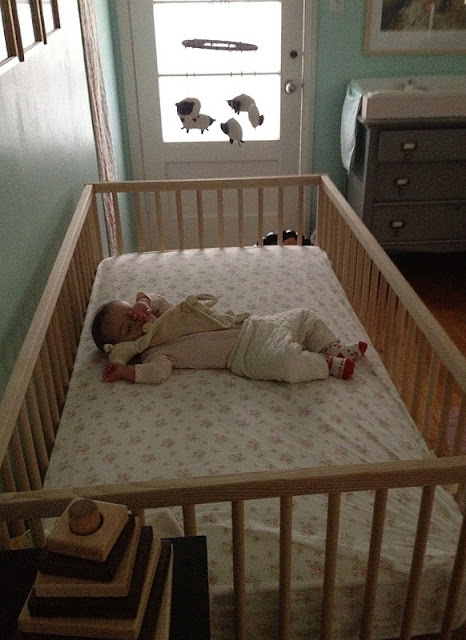 2) I liked having her in her bassinet close to our bed, and even liked having her sleep on me. She's a warm, adorable, good smelling baby. Why wouldn't I want her on me cozy in bed together? Oh right, because she woke me up every 20 minutes moving around or wanting to nurse. Still, it was hard to let go and have her sleep in a different room from me. 3) I was frightened of long nights of her screaming with us going in and out a million times comforting her and not getting any sleep for weeks. It took a pediatrician appointment, a book recommendation from Amy/Lynne, and a gentle hint from Jerod about baby brain development needing deep sleep hours to get me serious about teaching Elsa how sleep should work. Jeff and I both read "Good Night, Sleep Tight" and started putting Elsa in her crib for night time sleep and regular naps. It's been over a week now and I am so thrilled to say that she is sleeping so well now. The crying is minimal, and it's usually just sleepy whines until she soothes herself to sleep. We get up a few times a night when she starts really crying to check on her and give her the dropped pacifier and that almost always does the trick and gets her right back to sleep. I think she was really needing this deep sleep and is why she's taken to it so well. Jeff and I didn't have high hopes for this working out this easily, so we're pretty damned pleased with ourselves now! We're amazing parents. GREAT to hear Elsa is sleeping so well and also giving you and Jeff a break so you can (finally) catch up on your sleep. Nice to see your friends and colleagues helping you with the justification you needed to make it happen. You ARE damn amazing parents!! Good for you!!! Congratulations! It is not easy to make the decision to take control with the risk of upsetting her and having to listen to a few nights of crying. But you did it and it worked!! You will all be so much happier now! You will all be so much more rested and ready for each new day. I am really proud of you both...and Elsa too! !